What is the value of your ten dollars? I suppose most people are inclined to say ten dollars is ten dollars anywhere in the world. This question makes no sense at all. Well, let’s try an exercise. 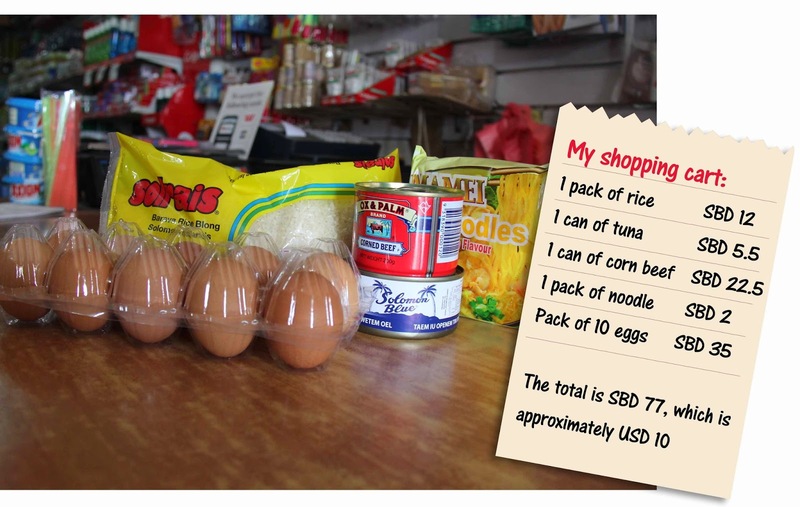 Convert US$ 10 to your local currency and head to the closest supermarket to see what your money can buy. With the help of my local colleague Atenia Tahu, we decided to pick some of the common staple food items in the Solomons. Here is a picture of the value of my US$ 10 in Honiara. Part one of the exercise done! Now account for the fact that the average income of a Solomon Islander is around USD 1,130. Oh, by the way, did I mention it is USD 1,130 annually and not per month? That makes it a monthly salary of USD 94.16. Here is the challenging latter part of the exercise (drum roll). Try living on USD 94 for a month. This amount should cover your rent, food, clothing, transportation, recreation, phone and, of course to continue reading my blogs, the internet. Maybe we can drop the recreation, phone and internet since technically these are not basic necessities. I’m sure some may find this highly debatable but let’s be honest. If you sustain a month under USD 94, I am truly impressed. If you succeed in going through two months, I bow down to you. If you go through three months, I want to move to your city. Please drop me a note. Since the day I arrived in Honiara, I’ve been surprised with the price tags here. Bear in mind, I am Singaporean. A recent study named Singapore as the world’s most expensive city, plus the country has a ton of millionaires. And yet, I think it is really expensive in Honiara. My grocery bill here tends to be about twice as much as in Singapore. Even fresh produce grown locally in the Solomons is surprisingly expensive. I realise people can live a simple life with very little and get by each day without issue. I understand it is possible but it also means they are potentially living on the edge. With no backup and no savings, one unexpected accident or disaster can change the entire course of their life. And in the case of Honiara, the high costs and relatively low income make it nearly impossible to save for a rainy day. The gravity of this issue hit me when I joined the UNICEF Pacific team on an emergency feeding programme in one of the schools on the outskirts of Honiara. The feeding programme started last week in response to last month’s flash floods that affected nearly 32% of the population living in Honiara and the nearby Guadalcanal province. Considering the scale and aftermath of the floods, many people are going through a tough time feeding themselves and their children. Also since the floods, many children have not returned to school. While education is valued, unfortunately it is not high priority. UNICEF hopes a proper meal will draw them back to schools, deal with short-term hunger and ensure kids get the nutrition they need. One stone, three birds. The fear is that if they don’t get a proper education, they are likely to be stuck in the cycle of poverty. So the programme aims to get the kids back into the classrooms with the help of food. Makes sense, right? Interacting with the children made for an interesting, fun morning. The kids were on a short snack break. I had the chance to hang out with them and learn a fun game called ‘Water In’. But more on that later. The visit deserves an entire piece to itself. The school visit made me realise that everything I considered normal and natural about my childhood barely exists here. I never had to worry about food, my safety or missing school. It all just happened. But here in the Solomons, UNICEF Pacific and its partners step in to ensure families can raise healthy children in a safe environment with an education that empowers them. The wholesome approach makes sense. As they say, if you think education is expensive, try ignorance. And health is wealth. While the value of wealth can be measured (remember the ten dollar exercise? ), the value of good health is immeasurable. Beautifully and clear Neha! I enjoyed reading your blogs. Thank you and keep them coming. In the Solomons, Culture is another thing.Please note, most employed Solomon Islanders do not only support their own family but often and always their extended family too - makes it more expensive! .